No passport? No problem with this family's reviews of the U.S. Virgin Islands to help you decide which of America' s Caribbean isles is right for your family beach vacation. American family in search of hassle-free Caribbean vacation? It’s a no brainer: the U.S. Virgin Islands. No need for passports or foreign currency, everybody speaks English and your hair dryer works without voltage attachments. Jumbo jets fly to the main airport and puddle jumpers make it easy to get from island to island. Just get used to driving on the wrong side of the road. The real question is: St. John, St. Thomas or St. Croix? Although each is filled with stunning beaches, superior snorkeling, terrific hiking trails and resorts ranging from luxury to eco-camping, each Saint has a distinct personality. My 10-year old son Jamie and I recently discovered the differences. The smallest and least populated, St. John primarily is protected national park land donated by Laurence Rockefeller 51 years ago, and the remainder is thankfully not heavily developed. This is beach lover nirvana — gorgeous white sand beaches separating clear turquoise waters from lush mountains filled with tropical flora. Its unspoiled beauty and laidback vibe, even in quaint Cruz Bay, full of art galleries, shops and restaurants, made it our hands-down favorite Virgin and one of our all-time Caribbean favorites. Like many others we played on St. John’s Trunk Bay beach (well-known for its 225-yard underwater trail marked by descriptor plaques) while mustering up the courage to meet our SNUBA instructor. Thank goodness we didn’t chicken out. The shallow-water dive system requires no certification, lengthy training or heavy gear, making it perfect for adventuresome kids (ages 8 and up) and their skittish moms. VI Snuba owner Tammi Cummings patiently oriented us to the proper underwater diving signals, breathing apparatus and buoyancy belts before leading a few shallow-water drills and then diving in with us for forty-five minutes. Jamie loved his first SNUBA experience — he spotted a small octopus, countless schools of colorful fish and loads of coral, all the while giving his nervous-nelly mom the thumbs up sign. 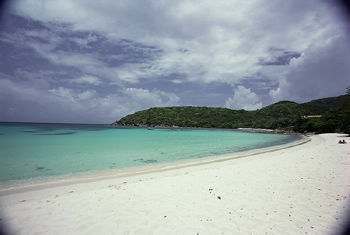 The two full-service resorts on St. John are wonderful: the tony Caneel Bay and the Westin St. John. Both are kid-friendly, but I give the Westin St. John a slight edge for families from a value standpoint. Jamie really enjoyed the evening kids program where he won the hermit crab races, watched the resort’s iguanas get their nightly feeding and caught a dive-in movie on a raft at the hotel pool. In the meantime, I had a memorable dinner in downtown Cruz Bay at La Tapa, a hip little open-air restaurant with a decidedly urban feel, right down to the cute little beatnik guitar player who sang like Jewel as we dined on top-notch Mediterranean food. For general information about the USVI, head to USVI Tourism, St. John or call 800/372-USVI. St. Thomas lies three miles and a twenty-minute water taxi ride from St. John, but it feels worlds away. The island is home to the U.S. VI’s capital Charlotte Amalie, the busiest cruise ship harbor and one of the busiest shopping hubs in the Caribbean. Charlotte Amalie’s streets and alleys are lined with store after store filled with electronics, jewelry, cameras, perfume and liquor at duty-free prices. (U.S. residents can bring back $1,200 worth of goods, duty-free — three times the norm — a bonus for the die-hard shopper in the family, but not my primary reason for traveling.) The town gets crowded when the cruise ships are in port (apparently Fridays are less crowded), and rush hour can be a bear. Beyond chaotic Charlotte Amalie lie the island’s family-oriented diversions. Like most visitors to St. Thomas, we checked out Coral World, a five-acre marine park with a three-story underwater observation tower located one-hundred-feet offshore. We ogled the sponges, the vast variety of fish, deep-sea flowers and coral in their natural state. Jamie was fascinated with the shark and stingray pools and the sea turtles (memories of his recent trip to the Galapagos?). Coral World’s admission fee includes unlimited access to the small, adjacent Coki Beach, a lovely and popular (reportedly often crowded) spot for snorkeling with another VI Snuba outpost. The guides at Virgin Island Eco Tours escorted us on an inflatable dinghy to the pristine, offshore island of Cas Cay, where we hiked through a mangrove forest to a hermit crab village for crab races (shaded, thankfully). We continued hiking past a geological blowhole, tidal pool, coral and shell beach and cave with “pirates treasure” (gold coins and eye patches planted by our guides) for the kids to discover before our group snorkeled in the protected mangrove lagoon. Our temporary home on St. Thomas, the 300-room, sprawling Sugar Bay Resort — a Wyndham Resort at our visit and now independently run — is one of the few all-inclusive properties in the Virgin Islands. Not a big fan of large, all-inclusives, we nevertheless enjoyed our brief stay at the Wyndham and spent most of our limited on-property time in the three large interconnecting pools, playing water basketball with other guests instead of playing on the small beach. For general information about the USVI, head to USVI Tourism, St. Thomas or call 800/372-USVI. Though ferries are readily available, we traveled from St. Thomas to St. Croix by seaplane, a scenic, smooth but noisy mode of transportation. In 20 minutes, we were in lovely, historic Christiansted, ready to explore our third island. The largest of the sister islands, St. Croix has two distinct landscapes — tall, green forest on one end and dry, windswept scrub and grasslands on the other. Once home to more than one hundred sugar mills, decaying plantation houses and windmills dot the landscape. While St. Croix offers plenty of duty-free shopping, golf, historical landmarks, beautiful beaches and eco-opportunities, the island gets far less attention than glitzy St. Thomas and laid-back St. John. It feels almost like a secret. Hiking is big on all three islands, but we will never forget Ras Lumumba, the spry, aging Rastafarian owner of Ay-Ay Ecotours on St. Croix. Throughout a long, hot hike through gorgeous forests, steep hillsides, open fields, thick brush (taller than Jamie at times) and colonial ruins, Ras Lumumba kept both the adults and kids in our group spellbound with his knowledge of local flora and fauna, the colonial history of St. Croix and Caribbean bush medicine. At times Ras would stop dramatically to whack away at some plant in our path and have us taste its delicious innards, even if it smelled god-awful. He created a sturdy rope from another plant in a matter of minutes and reported that others were as effective as modern day Cialis. At one point we ran headlong into the path of a bull that was looking to rumble, but we were in good hands: Ras simply brandished his machete and stared down the bull. Phew! Mark Mile Watersports took us on a lovely half-day sail to Buck Island, America’s first underwater National Monument and St. Croix’s most popular attraction, renowned for snorkeling. After spotting an eagle ray, sea turtles and dolphins en route, we anchored offshore to snorkel in the crystal clear water above beautiful coral reefs, sometimes in rather deep water. The Mark Mile crew worked closely with the snorkel shy kids onboard, including Jamie. In no time, Jamie was snorkeling comfortably twenty feet above sea urchins and fire coral. We then played on the island’s beautiful white sand beach amid scads of beautiful fish (and numerous other boats) while on unsuccessful lookout for Sammy, the affable stingray who often joins the swimmers. One evening we ventured off on a moonlit kayaking tour of Salt River National Historical Park & Ecological Preserve, the only place Christopher Columbus landed on (now) U.S. soil. Our guide and fellow kayakers thankfully were patient as Jamie and I struggled to propel our two-person kayak (cooperation and known center of gravity required). As we floundered under star-lit skies through the calm, bioluminescent bays amid protected mangrove forests, our guide regaled us with St. Croix folk tales, pirate legends and a few local ghost stories. We stopped splashing our paddles often to sweep our hands through the waters to reveal the blue and white glow from the phosphorous in the water. Jamie and I thoroughly enjoyed ourselves but were quite weary (and wet) after two hours of paddling. There are a few full-service resorts and several small, quaint hotels on St. Croix. Our home was The Buccaneer, a 132-room family-owned property that has warmly welcomed its guests for more than 50 years. The most upscale property on the island, The Buccaneer is arguably the best choices for families and a good value (the year-round kids camp is included). Guests stay perched up high either in the main building with its stunning, panoramic open-air lobby, terrace and restaurant, or in extremely roomy family cottages or doubloons that overlook the sea. Besides the two pools and three beaches, there is a well-regarded tennis program (eight lighted courts) and 18 holes of golf on site. We took a historic walking tour of downtown Christiansted, which once served as the capital of the entire Danish colony. We wandered by Fort Christiansvaern, an imposing, yellow-brick structure built to ward off pirates and imprison those who were caught plundering the island's ports, and the stately Government House which dates back to the days when 'sugar was king' in the West Indies. We ambled past colorful shops and restaurants housed in old Danish colonial structures. Despite the fascinating stories and architecture, the walk was a bit too hot and informative for Jamie, who wound up taking pictures of stray chickens (digital camera courtesy of duty-free St. Thomas) to pass the time. For general information about the USVI, head to USVI Tourism, St. Croix or call 800/372-USVI. Ay-Ay Ecotours and Hikes 340/772-4079 or 340/626-5385. Prices vary based on type of hike. Mile Mark Watersports/Buck Island 340/773-2628. If you find a website for them, please post it in the Comments field below. The U.S. Virgin Islands are like three good friends: they all share something in common with you, yet their differences make you want to spend time alone with each. So if you like friends who are into hiking, swimming, snorkeling, diving, beaches, dining and luxury, you have come to the right place. And you can choose to hang out with the one who likes to shop and party, St. Thomas… or the one with the Bohemian streak, St. John… or the quieter one with the mysterious past, St. Croix. They all are here. St. Thomas isn’t the island for me. Personally, the last thing I want to see when entering a Caribbean port is an oversized Rolex store, a local market overflowing with cheap goods from China, and a misplaced McDonald’s. The Wyndham Sugar Bay Resort is well-kept, but has some of the worst service I’ve ever experienced. If you’re not there on an all-inclusive, they’ll nickel and dime you to death with $20 to $50 to check your email, or even more to get online from your room. My room’s internet connection did not work and when alerted to the problem, the cranky staff did nothing beyond making false promises and passing the buck and I left having never been able to connect. The beach is rocky and uninviting and so far from the rooms as to almost make it not worth the visit. Snorkeling gear is free to guests, but they make you pay $5 for life vest’s for your little ones. I had to leave my credit card as a deposit when they wouldn’t take my room number instead.